Hello! I’m Jenny, the owner at Jenny Blossom. We opened the shop in 2016. We wanted to transform the usual associations with High Street Jeweller’s by introducing modern jewellery ranges and tactile jewellery shopping. I want my customers to enjoy shopping for gifts and accessories by being able to touch and try jewellery and personalise with engraving. If we can’t source the perfect item we will happily make it. The shop is every jewellery lovers dream with something for all ages and styles. Rowena is our in-house jeweller using traditional techniques for repairs, commissions and design. We use CAD designers to help our clients visualise bespoke designs and use a workshop in Edinburgh for stone setting and sentimental items are ensure they never go through the post. Owner of Jenny Blossom since it opened in Bonnyrigg, Midlothian, Jenny lives and breathes jewellery and fashion and is happiest when on the shop floor styling clients over a coffee or a cheeky glass of bubbly. LOVES: her kids, holidays sparkly jewels and GIN! 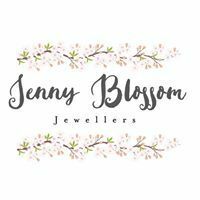 Jeweller at Jenny Blossom since August 2017. Recently married and owner of a our shop dog Zeus. Jakki is the trendiest Granny around. She loved jewellery and things that sparkles. You'll find Jakki organising the shop and taking care of the watches on a friday morning.